It is exactly this call to wake up the world that led to the birth of the Rise of the Roses project. A small group of girls, having developed strong friendship through their involvement in the Michaela Foundation, were inspired by Pope Francis’ call for Religious Congregations to “wake up the world”. They wanted to find a way to promote and celebrate the year of Consecrated life. These girls believe there is an eagerness to know God and a huge amount of energy and joy that is palpable when young people embrace their faith. 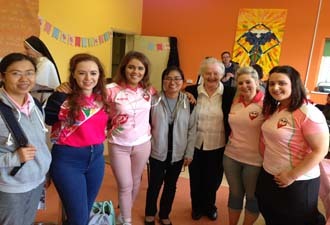 With their mission to celebrate and promote consecrated religious life in Ireland, the rise of the roses team embarked on a nationwide summer tour. 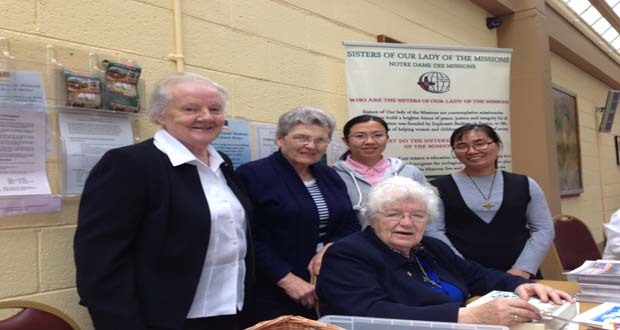 They visited ten convents on consecutive Saturdays from 13th june to 15th August. They began their tour in Faughart, Co. Louth at the birthplace of St. Brigid ( Mary of the Gael). They concluded at Knock Shrine in honour of our Lady – Our Golden Rose – on the feast of the Assumption. They carried a simple cross which they collected in a scrap yard and embellished and decorated it on their journey. (reminding us a little bit of Jesus carrying his cross) They invited young people to join them at each convent as they met the Sisters, learnt about their way of life and their love for God, sang and had a “wee tea party,” held and hour of Eucharistic adoration and planted a rose. They also wanted to promoted the power of the Rosary so the ten roses planted around Ireland symbolised a decade of the rosary. An invitation was issued to all to join them in Knock on August 15th and it was in response to this invitation that Srs. 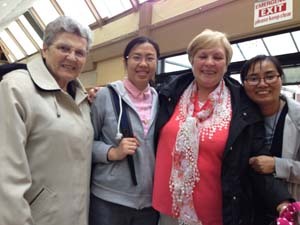 Antonia, Ita McCabe, Thuy Linh, Minh Thao and Mary Foley made their pilgrimage to Knock Shrine on the Feast of the Assumption – the close of the tour of the Rise of the Roses. When we arrived in Knock Sr. Ita had already set up her stall with the “Pop Up” which we used at the Eucharistic Congress and also what vocation leaflets we had. (photograph above) We then joined the Roses for a cup of tea and a chat. They were very interested in hearing our story and it was a real pleasure listening to theirs’. At twelve o clock we joined them in the Blessed Sacrament chapel when they explained their belief in God. First they told us about their name “the Rise of the Roses” They said the Rose is the symbol of beauty, of love and of promise. The rose bud gradually opens and unfolds its petals and becomes a beautiful rose. When we open our hearts and let God in we open the petals of our heart. Even when we make the slightest movement God comes running out to meet us. Sometimes this can be a struggle, they said, but it is very liberating. They also likened our hearts to the tabernacle – we need to open the door of the tabernacle to bring Holy Communion to people just as we need to open our hearts to bring God to the world. Right through their talks they stressed that it is God who does the work. The talks were interspersed with singing – one of the hymns was composed by themselves “Rise up Roses” and all the congregation joined in when they sang the chorus from the “Lady of Knock”. After this Sr. Ita had a lovely picnic lunch prepared and set out on a table in St. John’s Centre. We thoroughly enjoyed it and listened to the people who spoke to us as they passed by. A sister of Martina McNamee R.I.P. came and asked us who we were as she had seen “Sisters of Our Lady of the Missions” on our chart. We had a good chat. Lynh had a photograph taken with her to show to Sr. Regina McCullagh who knew Sr. Martina’s family well. At three o clock we had Mass celebrated by the Bishop 0r Raphoe who concelebrated with Archbishop Eamon Martin and Bishop Hegarty. The Roses provided the choir and the readings. There were numerous priests. who helped in distributing communion and in the blessing of the sick. The Shrine was packed and some could not get seating. Archbishop Eamon Martin preached the sermon, beginning with our Lady who had consecrated her life to God just as the Religious women, men and priests have consecrated their lives to God. He paid tribute to what they had contributed to the world over the years. It is poignant that we offer our prayers to our Lady, “The Golden Rose” of Ireland who inspired Michaela McAreavey. Michael’s untimely death has inspired so much of this good work and whose life is a lasting memory. She believed that God, the Roses said, has a special plan for each of us, and it is only by following God’s will that we can attain true and lasting happiness. It is the sincere hope of all the young roses involved in this project that the tour will ultimately raise awareness of the happiness and joy that comes from saying “YES” to God.